Saturday 4th May will see a truly Shakespearian evening at Theatre 62 with extracts from The Taming of the Shrew, Julius Caesar. 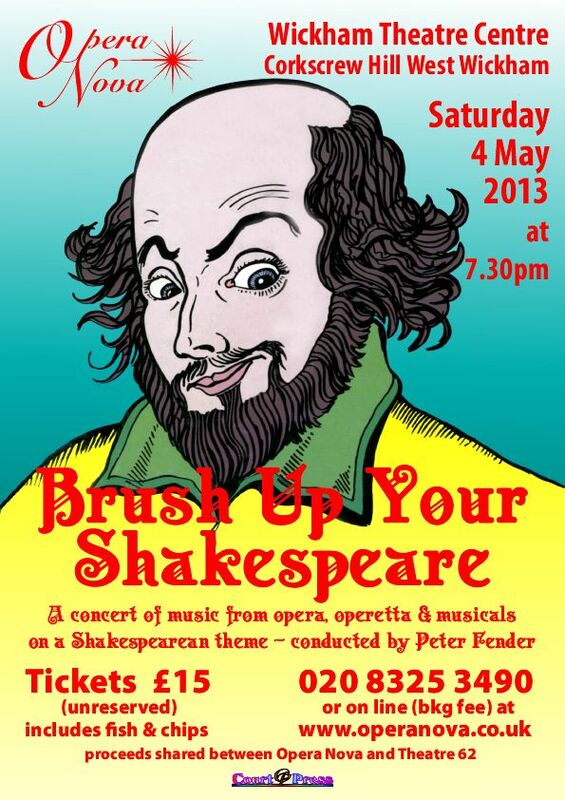 Macbeth, Othello, Romeo and Juliet, Falstaff, As you Like it, The Tempest and A Midsummer Night’s Dream. Theatre 62’s actors however will be having the night off as our affiliate member, Opera Nova, will be bringing us extracts from the operatic and musical versions of these plays written by amongst others Leonard Bernstein, Handel, Elton John, Cole Porter and Verdi. The programme will include a veritable coven of witches from Macbeth together with a sleep walking Lady Macbeth; the beautiful Willow Song from Othello and extracts from three versions of Romeo and Juliet, including Maria and Tonight from West Side Story. Finally find out which Shakespeare play lies behind The Lion King. Opera Nova brings together both professional and amateur singers. Its musical director Peter Fender is both founder and musical director of Philharmonia Brittanica as well as a composer and violinist. Opera Nova’s Slovak accompanist, Andrea Kmecova, regularly performs as a soloist, vocal and instrumental accompanist, and chamber musician across England and Europe. Tickets, price £15, include a fish and ship supper, can be booked on 020 8325 3490 or online at http://www.operanova.co.uk (booking fee).